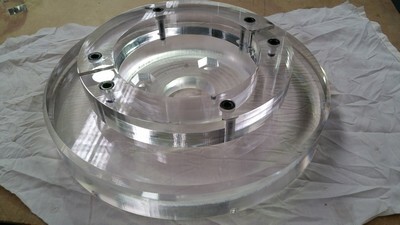 Industrial Plastic Solutions provides a Cnc contract Perspex Cutting service in Melbourne Victoria. We are the experts in Cnc Routing and cut all types and thicknesses of Perspex sheets using the latest Cad Software and Cnc Router. We do jobs for the general public including one offs and multiple runs. We specialize in scientific equipment and Perspex displays. When you need a custom Perspex counter display call us for a free quote and we will help you with your design process. We also provide an immediate Perspex saw cut to size service while you wait. So if you need a Perspex window for insulation purposes or light diffuser we can normally do it on the spot. Odd shapes will have to be booked in. Our eight tool change vacuum bed router is capable of machining sheets at 2440mm x 1500mm up to 50mm thick, meaning we can cut large diameter Perspex discs in-house. We also stock material so you can be assured of a fast job completion. When requesting a quote on Cnc Router cutting of shaped jobs please send through files in either DXF, DWG or EPS format so we can input them into our machine for machine times for quotation purposes. We cut Perspex and Acrylic Mirror to size including Polycarbonate Sheets. We also cut to size Rod Sheet and Tube so give us a call when you need the professional finish for displays or signage. Plus, too much more to mention if you can think of it we can probably make it. Click here for material weight calculator.